the first time; smooth and fruity with a little pungent kick. Wonderful! 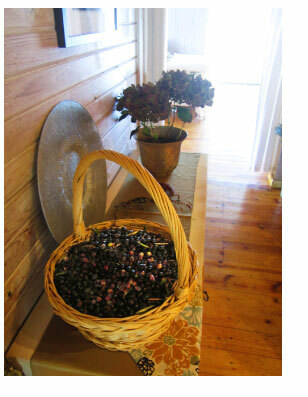 Above: A harvest basket sits on a sideboard, while lunch is prepared for the pickers. Next row: The trees in the early morning. At left: One of the fustis sits on the sideboards, tasting bowl alongside. 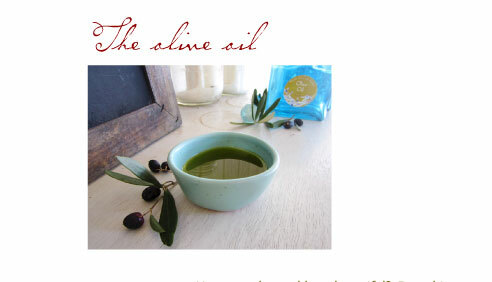 There is nothing like fresh olive oil. 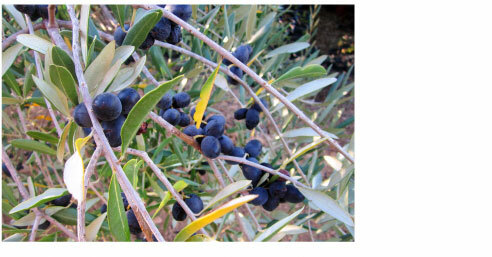 Above: The olives we picked - dark purple this year. Below left: Franny and Lulu wait for lunch - anybody's lunch. How to make a cabbage beautiful? Even this cabbage from our garden which would win no prizes for prettiness but we know it tastes just like a cabbage should. And that’s just the problem according to cabbage non-appreciators. Cabbage is a lot of work for not much reward and they only eat the slaw for the mayo. So try this: Slice the cabbage thinly (you’ve washed it, removed the chunkier leaves, etc.) Heat some olive oil (I know you’re not supposed to cook with it, but humor me) in a pan. Sear the cabbage for maybe a minute. Take an orange and squeeze it over the cabbage while it’s still in the pan. Add freshly ground pepper and sea salt and serve. No one invited Candi the horse to the baby shower for our new friend Nylah (born 2 weeks later - Welcome!) but Candi showed up anyway. 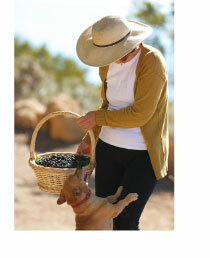 She strolled among the tables making new friends and eating the lawn (very politely ignoring the pretty pink floral arrangements) and wasn’t sent home until she started eating the dog food. I just couldn’t take these photos of Hoover down because besides being cute they are evidence that we do actually bathe him. He’s called Hoover because he was found on Hoover Boulevard in downtown Los Angeles. He is stinky. He can play soccer (he’s amazing in goal) but tends to hog the ball. He has a Facebook page. And he also eats raw olives. A true street dog.